This is one large meal where there is no guilt in supersize portions. And it’s not primarily made of corn, unlike some *other* supersized options out there. I’ve been dreaming of stuffed squash for the last month. So colorful. So flavorful. So fun! And with these wholesome ingredients you can’t go wrong. When we found this beauty at the farmers market, I knew the time had come. Chopping this super size squash in half provided great entertainment for the kids, a task that proves challenging for me every time, apparently it is a talent I just may never master. Thankfully squash is forgiving. While it bakes, add 2 Tbl. olive oil, onion and celery to skillet. Cook until softened and shimmery. Add sea salt and pepper to taste. In a large bowl toss apple with lemon juice. Add quinoa, pecans, raisins, sage and sauteed celery and onions. Pull the squash out of the oven, flip over and fill with quinoa stuffing. Cover with foil and bake for another 30-45 minutes, or until flesh is soft in the center. This entry was posted in Main Courses, Plant-based (Vegan). Bookmark the permalink. Yum! I’ll have to try this when hard squashes start showing up in my farm delivery! I have never heard of banana squash! I love stuffing acorn or butternut. These look great! This squash was almost 3 feet long, meaning almost as tall as my daughter! So many squash varieties out there, I find new ones every year, especially in the Rare Seeds catalog. This looks delicious! I’m endlessly surprised by how many different types of squash there are; it seems you can only get butternut here. Butternut is so lovely and versatile- if you only have one variety of squash, you couldn’t have made a better choice! I was wondering how you were going to cut open that monster on your countertop. The stuffing looks AWESOME! Except when your pants start not to fit… Tee hee! Love the apples, raisins and pecans in there! Mmmm… sweetness. Starting to brainstorm ideas for the VVP! Looks great! I do love me some stuffed squash. Thanks for sharing! Holy moly! That is truly a wonderful sight to behold. I have a bunch of acorn squash on my counter waiting to be purposed. Let me know if you mix it up! You bet! It will have to wait, though – the next squash on my agenda is the huge butternut lurking in my cupboard. 🙂 I love fall! 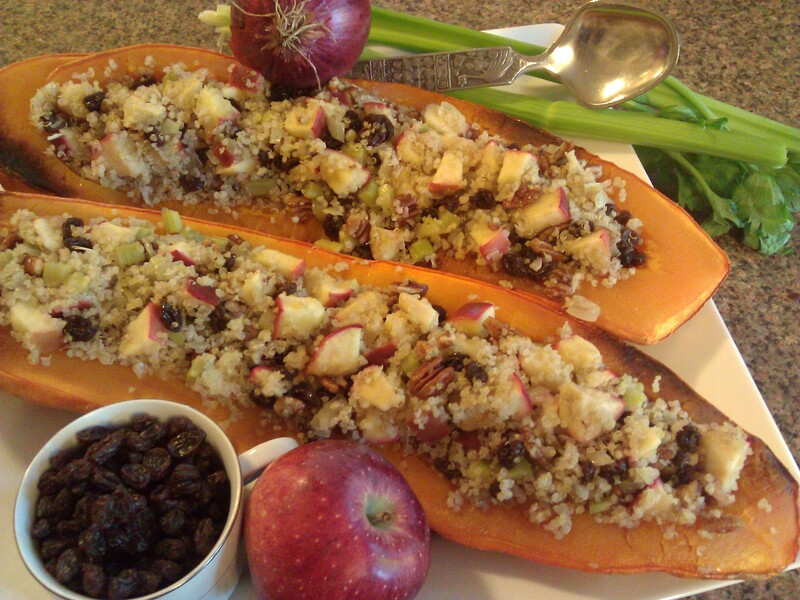 Looks amazing – I never stuffed a squash before! I need to try it!